This paper was prepared to identify some of the priority areas in which environmental management must be implemented to facilitate lasting and sustainable economic growth and social development in Cuba. The goal is to outline the initial effort required to support the Cuban Government to assess, structure and implement its environmental management, when a transition to democracy and market economy begins. Recognizing the close relationship between a healthy environment and a prosperous economy, this paper is an attempt to define the priority actions to recover environmental quality and to promote a wise use of natural resources. However, this paper does not pretend to be exhaustive or cover all possible aspects for the restoration of environmental quality in Cuba. That is a major undertaken that must be the result of careful and detailed planning effort by an eclectic team of experts comprising various disciplines of the natural and social sciences. The need to anticipate the nature and extent of an environmental program for a free Cuba can not be overemphasized. As has been demonstrated by the Eastern European countries, during a transition to a market economy, there exists the danger that market, policy and institutional failures might impede the emergence or effective use of environmental control mechanisms and further allow the deterioration of environmental conditions. This could happen to Cuba. The process of economic restructuring in other former socialist states showed the limitations new governments have in terms of their abilities to finance environmental projects. Some remedies must be derived from the experience of other systems in transition in the former Soviet Union and Eastern European states. This article also anticipates future activities that may lead to further deterioration of renewable natural resources and environmental quality, for those same areas. This may be of potential importance as investment from the United States and other Western democracies takes place primarily derived from government policies and decisions. Present impacts are usually not economically impaired since they take place in resource-intensive areas of tourism development disregarding ecological safeguards. When current restrictive economic limitations are removed, the natural ecosystems will face larger risks. • program a series of transitional planning workshops. The estimated cost for said environmental program is approximately $236 million (M), for a five-year period. A summary of the cost per component is indicated in Table 1. Details explaining the rationale behind these figures are included in the last section of the paper. The paper also proposes to continue working on the conceptualization and development of the overall program in two ways. The first one is a deeper analysis of said components, particularly tourism, in the north western coast of Cuba, around Varadero. The second, is a broad effort to look for consensus among the various environmental concerned groups of the Cuban and U.S. community through a series of workshops in selected U.S. cities to further expand on several of the program components. Cuba is an archipelago, part of the West Indies in the Caribbean Antilles, composed of the island of Cuba and about 1600 smaller islands and cays, with a total population of about 12 million people. Most cays and islets are low lying and uninhabited. Cuba is the largest and western-most of the Greater Antilles and lies strategically between Florida and the Yucatan Peninsula. The island of Cuba is the 15th largest island in the world, with a total surface area of 104,945 sq km, 1250 km long and 191 km wide at its widest point. Cuba also lays claim to the 220 sq km Isla de la Juventud. Havana is less than 150 km from Florida’s Key West, in the United States, and Pinar del Río Province is 210 km from Mexico’s Yucatan Peninsula. Cuba’s other close neighbors are Jamaica, the Bahamas and Haiti, with the latter only 77 km away across the Windward Passage. Much of Cuba is made up of fertile flatlands, where cattle are grazed and sugarcane, coffee, grain, tobacco and other horticultural crops are grown. The Oriental, Central and Occidental mountain ranges cover 25% of the country, the highest point being Pico Turquino (1972 m). Cuba’s longest river, the 343 km Río Cauto, is barely navigable, even for small boats. The North American and Caribbean tectonic plates2 meet in the 7200 m deep Cayman Trench between Jamaica and Cuba, and the region is thus prone to earthquakes. There are more than 6000 plant species in Cuba, around half of which are endemic. The well known royal palm (Roystonia regia) is represented on the country’s coat of arms; there are said to be 20 million palms in Cuba. Cuba’s other flora includes the rare and prehistoric cork palm (Microcycas calocoma), a throwback to the Cretaceous period; the jagüey, a fig tree which has aerial roots; the palma barrigona (big belly palm); the ceiba, the sacred silk-cotton tree; and the mariposa (butterfly jasmine), the white national flower. Much of the southern coast has mangrove swamps that support small fish and bird life while the majority of the northern coast is bordered by sandy beaches. Cuba’s most abundant land fauna is reptilian, and includes crocodiles, iguanas, lizards, salamanders, turtles and 15 species of nonpoisonous snakes. The largest land mammal is the jutía (Capromys), a tree rat which grows to about 60 cm in length. The world’s smallest bird comes from Cuba: the bee hummingbird, or zunzuncito (Mellisuga helenae), is just bigger than a grasshopper and weighs only two grams. The tocororo (Priotelus temnuros) is dubbed Cuba’s national bird due to its red, white and blue plumage — the colors of the Cuban flag. There are no great differences in seasonal temperature in Cuba, its pleasant subtropical climate being augmented by the gentle northeasterly trade winds. The wet summer season is between May and October, and the drier winter season runs from November through April. The average temperature reaches 27°C (81°F) in July and August and 22°C (72°F) in February. An average of 80% humidity exists all year round. The most important political event in recent Cuban history was the revolution that led to Castro’s military alliance with the Soviet Union and Warsaw Pact that substituted pre-1959 intense and close trade with the United States. For the first 30 years of the revolution, this geopolitical, economic and philosophical shift reduced trade with the United States that was offset by large economic subsidies from the former Soviet Union and by favorable trading relations with the members of the former Soviet Bloc (COMECON). Between the early 1960s and the late 1980s the environmental situation worsened despite Cuba’s achieving one of the lowest population growth rates in the world and reducing extreme living standard differentials in rural areas, two of the primary reasons often blamed for environmental deterioration in developing countries. The government’s approach was to “conquer nature” and under its central planning approach, it did not take local circumstances into consideration. This disregard for the environmental consequences of development projects continues to this day despite official allegations to the contrary—as the country pursues an economic survival strategy based on the crash development of the tourist sector and exploitation of natural resources. Therefore, the concept that environmental disruption was not supposed to occur under socialism since it was guided by scientific policies, and could only beget environmentally benign economic development, is not true. In reality, the socialist environmental record proved to be far different from the utopian view and it is now perceived that the environmental legacy of socialism will present serious challenges to future Cuban generations. In the next section, are a few examples of the abuses that the totalitarian regime has carried out in the country. The collapse of communism and its favorable economic arrangements and subsidies from the COMECON countries to Cuba in 1989 led to greatly increased economic hardships and rising international debt. This economic situation translated in increasing pressure on the natural systems (indigenous resources) within the country. Table 2 compares key Cuban economic statistics before and after the end of the former Soviet Union. By 1999, the economic situation seemed to have improved somewhat although official figures are elusive. The dramatic drop off in subsidized oil imports from the Soviet Bloc has been partially offset by renewed imports of oil, mainly from Venezuela and Mexico. Cuba’s determination to permit foreign investment is limited to tourism, joint ventures and very few other associations in areas of the economy principally related to nickel, oil and telecommunications. These partnerships reflect Cuba’s eagerness to join the world’s economy, to acquire some of the badly needed hard currencies. However, this expansion does not reflect either the conceptual/theoretical or practical methodology used in Cuba in its totalitarian approach. New foreign investment regulations promulgated in 1995 were designed to encourage foreign entities to include joint ventures, cooperative production agreements and autonomous enterprises in partnership with the Cuban Government. European countries, Canada, and Mexico are the main economies taking advantage of the opportunities in Cuba at this time. With sugar production declining, the Cuban government is encouraging investment in tourism as a way to increase foreign exchange and to boost production in other sectors of the Cuban economy—mainly food and building materials. Most of the growth, however, has been in the tourism sector. This sector grew by over 14% in 1994. Growth of 8.5% in nonsugar related industrial production helped the Cuban economy grow overall by about 1% in 1994. Nowadays, Cuban authorities are promoting a greater dialog on environmental issues. For example, a conference was held in January 2000 to investigate the use of environmental accounting to evaluate overall environmental policy and development, with participants from the Center for Environmental Policy of the University of Florida. The main areas of discussion included the most pressing environmental concerns in Cuba and included: tourism, coastal areas, wetlands and hydrological systems, forest systems, urban area environmental problems and use of sugar and mineral resources for trade initiatives. Cuban authorities have indicated that sustainability is a key factor when assessing potential impacts of proposed natural resource development projects. However, this idea remains an elusive concept. In light of fuel shortages and decreased imports consumer goods, Cubans have seen a real decline in living standards that have had a direct impact on the environment. The approach to environmental management from the Cuban authorities departed from the idealistic concept that human development in the new society would not hurt the environment or alter renewable natural resources. From an ideological point of view, the revolution should protect the environment and all development should be sustainable. Consistent with that ideology, the socialist constitution of 1976 explicitly endorsed the protection of soils and water resources as well as the atmosphere. Then, following the same line of thought, in 1983 the socialist Government enacted the Environmental Protection and Rational Use of Natural Resources Act. After passing this law, there was an avalanche of mandatory regulations that had to be enforced. During this period, the schools devoted significant efforts to study ecology and natural resources management and a great number of environmentalists were formed. However, these laws and regulations could not be efficiently implemented, since the decision making in the communist society occurs at the highest level of the government. The environmental professionals did not really have the option to assess the environmental impacts and introduce preventive measures. They were consulted on how to minimize impacts once the negative consequences were already out of control. Therefore, many of the more serious professionals made efforts to avoid participating on the evaluations councils. In that way the arrogance of the Cuban administration completely neutralized all potential benefits from the environmental framework previously discussed. This environmental mismanagement became more critical as Cuba lost the favorable trading terms and subsidies from the Soviet Bloc countries, after the collapse of the former Soviet Union. Particularly important was the loss of the oil subsidy, which stopped after 1989. In 1994, Cuba promulgated Law 147 granting authority to the newly created Ministry of Science, Technology and Environment to direct and control the development of policies to protect the environment and provide for the rational use of resources for the sustainable development of the country. Other ministries, including agriculture, sugar, industry, international trade, energy and mining, also have an interest in how their sphere of influence may perform against national environmental parameters. Beneath the ministries are several agencies, most importantly, the Environmental Agency, that are involved in the day to day administration of environmental concerns. Several institutes (dealing with Ecology, Geography and Oceanography), as well as academic and research institutions, are involved in environmental assessments, technologies and planning. Although economic and environmental concerns are increasingly addressed at the higher levels of the Cuban government, it is unfortunate that decision making has usually been ad hoc and in the absence of strong assessment tools and policy. The initial response of the Cuban government in 1990 to fuel shortages was to try and use indigenous reserves or alternatives to fossil fuels. With the economy in tatters by 1995, Cuba’s dependence on fossil fuels became apparent. If Cuba does not use imported goods and services from outside to amplify the country’s environmental resource base, it will continue to fall behind and living conditions will continue to deteriorate. However, at the same time, development should be scaled to the local conditions so as not to overload the natural systems on which the country depends. Overall, environmental decisions are still very centralized (in Havana), with only some provincial universities and research stations concerned with environmental studies outside of the capital. In spite of abundance of academically trained scientific and environmental professionals in Cuba, it is the Central Committee of the Communist Party that directs overall environmental policy. To the Party, these concerns are secondary to the economic, trade and development ones. In addition, the armed forces must approve all major plans for use of the country’s natural resources including forestry, coastal areas, water and infrastructure. The result is fractured decision making with a tendency to override sound environmental policy initiatives because of perceived shortterm economic imperatives. In spite of some improvements since 1994, Cuba’s environmental legislation — as it currently exists — is inappropriate to deal with many of the negative impacts from land use, large-scale development, restructuring of the infrastructure and foreign investment. The main source of new policy has been the inclusion of recommendations from international conventions such as Agenda 21.3 International environmental standards have been adopted by Cuban institutions usually after the ratification of international law in Cuban legislation. Cuba is a signatory to all major international environmental conventions including: the Global Environment Conventions (the Stockholm Convention and the Rio Convention), the United Nations Convention on the Law of the Sea (UNCLOS III), Bonn Convention (Global Warming), Basel Convention (Control of Hazardous Substances), CITES (Convention on International Trade in Endangered Species of Wild Fauna and Flora), etc. While many of the recommendations contained within these conventions are sound, they are very general, and must be modified for use with empirical data from the environment in which they are to be applied. The limited and somewhat vague policies and inadequate legal structure for the development of Cuba’s natural resources was apparent at the January 2000 conference in Havana. Cuban environmental law should be based on the recognition that increasing population, industrialization and urbanization place growing pressures on the limited assimilative capacity of the environment, and on the finite stock of natural resources. 1. Development of proper environmental policy and legislation for the protection and progressive improvement of the environment. In order to achieve this, policy efforts should be directed to control the main polluter — the Cuban government, which controls most of the country’s resources. Changes to the current system will require greater institutional strengthening and legislation as it contains no mechanisms for conflict resolution, enforcement of non-government entities and quantitative project analysis. The Cuban Agency for the Environment will need in the future to develop real enforcement capabilities. 2. The improvement of the environment should reflect and promote a new approach to economic growth that will take into account all components of the quality of life and not only the quantity of resources spent or even the goods produced. Therefore, economic and social development policies must be pursued in close connection with sound environmental policies, in order to ensure a balanced contribution to the improvement of human well-being. 3. The development, extraction, transportation, storage, use of energy and related waste disposal from existing and new sources as well as of other scarce resources, should take place under conditions that safeguard environmental values. When feasible, energy should be imported rather than produced locally. The Cuban economy is dependent on imports. Evaluation of Cuba’s economy in 1989 showed that around 60% of its real wealth was imported as oil. In 1990, the initial response of the Cuban government to fuel shortages was to try and use indigenous reserves or alternatives to fossil fuels. This policy may not be sound as indigenous reserves are of poor quality, costly to mine and environmentally unfriendly. Most known fossil fuel reserves are on Cuba’s environmentally sensitive northern continental shelf. Use of these reserves has failed to make up the shortfall. 4. The Government should actively seek to protect the environment by encouraging the promotion of non-polluting technologies, conservation of energy and other scarce resources, intensified efforts to recycle materials, and the development of substitutes for scarce or environmentally harmful substances. These technologies should be identified in the project cycle. Cuba was forced to implement recycling technologies in the 1990s as cost saving initiatives brought on by lack of foreign exchange to buy replacement products. The reverse side of this is the lack of technology, equipment and fuel to undertake adequate solid waste collection, recycling and disposal. Analysis into better systems to reuse and dispose of solid wastes are required. 5. The Cuban Government should promote observance of the “Polluter-Pays Principle” to encourage environmental protection and to avoid international economic distortions, and where desirable encourage the harmonization of environmental policies. The Polluter-Pays Principle can be used as the basis of funding environmental projects. 6. Comprehensive environmental planning, including for land use, should constitute an important element of government policy. The first step in developing empirical subjectivity in Cuba’s development policy is to undertake a complete analysis of the entire Cuban economy and its resource base. In 1999, a project to update the geological/ land use maps of Cuba was undertaken. It lacks, however, the ecosystem classification for management. Although GIS capability does exist in Cuba, most institutions rely on outdated, Soviet- era cartography. In the future, this should be undertaken using high resolution satellite imagery digitized and classified according to ecosystem function. Institutions that may undertake in the compilations of GIS information include the Geography Institute, with input from the Institutes of Hydrogeology, Ecology and Oceanography. Classifying by ecosystem defines an ecosystem type according to its dominant sources of energy. This may be the most appropriate approach for classifying the system as a whole for sustainability because ecosystems develop their prominent characteristics as part of self organization to maximize use of all sources and storages. Sound land use policy can only follow if first class land use data are provided. Future environmental standards applicable to Cuba may follow these initiatives. 7. Systematic assessment of environmental impacts of existing and new economic activities. In order to prevent future environmental deterioration, prior assessment of the environmental consequences of significant public and private activities should be an essential element of policies applied at the national, regional and local levels. Environmental assessments should be undertaken as a comprehensive tool useful in properly scaling developments to prevailing environmental conditions. Results from these assessments will be useful for the development of policies for improving economic vitality and make better use of the environment in order to further Cuba’s human and environmental prosperity. 8. Continued attention should be given to the environmental education, ratification and implementation of international conventions for the protection and conservation of the environment and to the development of new conventions. This section is an effort to illustrate how the current mismanagement of Cuban resources and the lack of democratic institutions have impacted critical and valuable resources along the entire geography of the Cuban archipelago. Furthermore, potential areas of concern are discussed. Tourism is Cuba’s fastest growing industry and a vital source of foreign exchange with which to buy goods and services internationally. Tourism increased dramatically in the 1990s because of new policies and because of Cuba’s attractive culture and relatively intact natural systems (coral reefs, coastal and high diversity forest areas). These attributes create a positive image and attract visitors seeking a pristine environment that is not overloaded by tourism development. At the same time, tourism connected the most pristine forest and reef areas in Cuba with the world economy. In addition, diversion of resources for high intensity (luxury) tourism has led to considerable social and economic disruption. The local resources that may be impacted by tourism include potable water supplies, waste disposal, solid waste systems, loss of wilderness areas, and excess loading on energy, food and transportation systems. • Environmental impacts from the operation of the resort complexes are greatest when developed in ecologically sensitive areas. • The greater the intensity of the tourism development and foreign involvement, the greater the potential to disrupt local ecological and economic systems. Albeit ineffectively, tourism concerns have caught the attention of the Central Committee of the Cuban Communist Party as well as of the scientific/engineering community because of its economic importance and also because of the disruption it can cause to ecological and social systems. With any development, the local environment may see declines in productivity, an increase in pollutant loads and conversion of wilderness areas. The local population has found itself excluded from traditional fishing and recreational areas. The tourism center of Varadero, in particular, is close to offshore oil platforms and the recent downturn in tourism to this part of the country may be partially attributed to the negative impacts of oil spills on its beaches. As investment in tourism in the past decade was rarely carefully planned, negative impacts will decrease the destinations’ appeal. As was anticipated in a 1995 study, tourism numbers for the most recent years have been less than anticipated. In sensitive coastal areas, coral reefs have been negatively impacted by nutrient loading,4 marina and infrastructure development and the decline in the population of the most desirable marine species because of demand by tourists. In sum, a great deal of the capital from Cuba’s tourism development goes into the necessary purchase of fossil fuels. Saving of fossil fuel can be made in some areas by using ecological engineering approaches to waste water disposal including recycling of wastewater through wetland systems, and solar driven limestone settling pools close to beach side hotels. Almost no resources or attention is currently devoted to careful selection of new construction sites, the state of existing infrastructure such as local water supplies, transportation, or waste disposal capabilities. Typically development does not take in consideration the regional economy, or the potential role of the local population. In the medium and long term this lack of planning and social and environmental consideration may cause the failure of those investments and the perpetuation of poverty within the Cuban frontiers. Because of its geography, most river systems in Cuba are relatively short. Because of the porous nature of the karst geology5 they are non existent in some parts of the country (i e., Pinar del Río). Rivers and streams within urban areas are reported to be almost all heavily polluted. For example, Río Almendares in Havana is heavily polluted with nutrient loads; a natural wetland recycling system is being proposed as part of a woodland restoration design for the headwaters of this river. Because of the large quantity of wastewater in urban areas, improvements to processing may require re-engineering and the use of modern water treatment systems. A complete revision of the cities wastewater treatment systems is long overdue. Among other reasons because no immediate solution is apparent due to the critical economic situation. Cuba’s most important wetland area is the Ciénaga de Zapata in Matanzas province. Other smaller sawgrass dominated wetland areas are found on the south coast. Important mangrove areas are found all around the Cuban archipelago and include all four Caribbean species. In the areas of karst geology there are many lagoons and lakes. In many ways it is similar to the Florida Everglades, with similar environmental problems including the invasion of exotic species. Changes to the hydrological cycle because of peat mining for fuel and earlier earthworks diverted water for rice and sugar production is manifest in these changes of wetland floral species. For example the expansion of Casuarina sp and other exotic species and the succession of saw-grass to cattail (Thyfa sp) due to increased nutrient loads. Examples of exotic fauna include species of deer and mongoose. Some initiatives are being made to restore the original hydrological cycle for this important wetland area as it represents important concentrations of bio-mass for highly migratory bird species. Another example of environmental mismanagement that severely impacted water resources is the Havana South Dike. This 70 km dike made mainly out of clay material, was built with the purpose of increasing the level of ground water recharge to improve the potential pumping from this critical water source and to reverse the saline intrusion trend affecting the aquifer. Although the measure has been partially successful, similar benefit could have been achieved at a fraction of the economic and ecological costs. Literally the dike has destroyed the ecological balance of the region including: flooding of valuable lowland areas with seawater, loss of a strip of mangrove swamps that protected the coast, increased erosion, and loss of valuable fertile soil resources, which are now carried in the form of sediment to the ocean. There they will interfere with light penetration and induce coral mortality due to reduced productivity and direct suffocation. Elsewhere, smaller wetland areas and streams have been modified and dammed into permanent lakes. Mangrove areas in Cuba are protected although cutting continues for charcoal and in Pinar del Rio, large areas are being cleared for marina development. The important position that wetland areas occupy in the landscape with regard to its energy signature needs to be appreciated in Cuba. This energy signature means that wetlands are concentrated areas of high production and capable of making large and free economic contribution for food production, waste assimilation, recreation, aesthetics and biodiversity. • The low cost of construction and operation. • Low use of fossil fuels and capital expenditure. • Flexible nature in isolated parts of the country. Another well documented phenomenon in the Cuban professional literature and in journalistic accounts, and validated in recent years by defectors with backgrounds in agronomy and hydrology, is the growing salinization of many of the country’s major aquifers. This contamination is occurring along coastal and other areas, as well as the contamination of others. Various factors have contributed to this state of affairs, including over-pumping of underground water stores and the damming of many of the country’s rivers and streams. Beginning in the early 1960s the country saw a major expansion in the land area devoted to water stores, primarily but not exclusively, to expand the acreage under irrigation. Large-scale interference with the ecosystem has resulted in major disruptions of natural water flows, by allowing seawater to filtrate inland and preventing aquifer recharge. Large-scale irrigation projects unaccompanied by the development of an effective drainage infrastructure are also to be blamed for the salinization of many of the country’s soils. Restoring the fertility of the damaged soils will take years. Wholesale discharges of contaminants by agriculture and industry and the severe and growing deterioration of the urban sanitary infrastructure have produced further damage. Near Havana, the coastal areas have been negatively impacted by development and cutting of strand and wetland vegetation. Havana Bay is heavily polluted from direct wastewater disposal, dumping and oil pollution. Water within the Bay has a high retention time and the sediments undoubtedly contain high levels of organic and metal contaminants. Metal contamination is originated by industry (paint, chemical processing, oil spills and run-off from roads). Swimming is banned near the downtown areas of Havana and tropical fish poisoning (ciguartoxin) is commonplace. Others coastal towns, Santiago, Guantánamo and Manzanillo are reported to have similar problems to Havana harbor. The principal minerals in Cuba include nickel, copper, and iron. Mining occurs in the Eastern highlands areas of Cuba and has a negative impact on the wet dry forest areas covering serpentine and olivine igneous rocks. At present the areas are reforested after use, mainly with pine species plantings. Alternatively, impacted areas may be reforested using ecological engineering approach, i.e. using the natural vegetation that is adapted to the high metal content of the soils. The seeds of this unique vegetation is contained within the soils and can be re-spread over mined areas if the soil is removed and stored before the mining begins. Cuba’s trade policy for nickel and other minerals needs re-evaluation. Heavy metals such as nickel have high value because of their concentration, and contribute much to the economy. Cuban policy may be better off mining this material more rationally and using it indigenously to make batteries and other products for export and domestic use rather than exporting the raw material. An evaluation of the sugar industry conducted in 1994 showed that Cuba’s principal export is costly to produce (uses lots of resources like soil, water, fossil fuels, fertilizer, and human labor) and has a low value in the world market. With sugar harvests declining in recent years, some areas have been allowed to revert to a secondary forest, for pasture, and close to urban areas for vegetable production. Environmental impacts from sugar production include extensive loss of low land forest, which has been cleared all across the country for this purpose; high use of phosphates and other fertilizers; negative impact to water resources during sugar refining; and diversion of important and limited resources for a crop of low international market value. Cuba may be better off reducing its emphasis on sugar production for export and using the resources dedicated to this production to grow food for local consumption and export or by replanting degraded areas with forests to restore soils and the hydrological cycle. The deterioration of the country’s soils responds to a variety of reasons, many of them associated with the capital intensive agricultural development approach pursued by Cuba from the early 1960s up to the late 1980s. This development strategy rested on the organization of production in vast agricultural holdings, high levels of mechanization, reliance on chemical inputs, and a major expansion in irrigation. Compounding the detrimental impact of this development approach were the inherent flaws associated with the nature of socialist management practices generally and in agriculture in particular. In Cuba and elsewhere in the socialist world, production directives issued by central planners were often oblivious to local circumstances, while farm managers were rewarded for their compliance with those directives, rather than for decentralized initiatives more likely to result in improved production outcomes with more benign environmental impacts. • poor drainage affected 2.7 million hectares. An extreme case is the southern plain in Pinar del Río, where land is now considered to be unproductive due to excessive use without proper soil management required for its naturally low fertility. Cattle ranges have also been severely affected with a notorious decline in soil nutrients and increasing soil acidity. Many scientists consider the deterioration of soil resources as the worst environmental problem in Cuba. Because of the diverse geology of Cuba, its location and other geographical features, Cuban forests have high diversity in relation to the size of the country, particularly in the highland areas of Eastern Cuba (high endemism and biodiversity). Several nature reserves and protected areas are found here. Some areas of upland old growth forest still have populations of the ivory-billed woodpecker — a species now extinct in the United States. Several projects proposed to produce energy from hydro-electricity in these mountainous areas were delayed in the 1990s because of economic limitations rather than environmental concerns. In Western Cuba, the secondary growth areas in the Havana province are characterized by low diversity and arrested succession due to the large distances to natural seed areas necessary for high diversity succession. One major initiative of the government from the 1960s was the reforestation of cleared mountain areas across the country. Some areas have been planted with fast growing but relatively low value pine species such as Pinus caribea. Although this is preferable to leaving areas without cover, more reforestation using natural succession or enrichment with high value native species is required to increase the value of these forests from an economic and ecological perspective. The most important considerations in terms of the risks posed by the handling and management of hazardous materials in Cuba is associated with the construction of the Juraguá nuclear power plant (NPP) in Cienfuegos, with Russian technology and standards. The plant may be regarded as the most important endeavor of the Cuban Nuclear Program, which began in the late 1960s. The agreement between the former Soviet Union and Cuba for construction of the Jaraguá plant occurred in 1976, and its construction began in 1983. Plans included the development of two 440-megawatt nuclear power reactors. The site is located in the Province of Cienfuegos, on the south central coast of Cuba, about 288 km south of Key West, Florida. The two reactors at Juraguá are the most advanced model (V318) of the Soviet-designed VVER-440 series of pressurized water reactors. Concerns for the United States derive from potential malfunction of the Cuban reactors, which could lead to a radioactive fallout in the Southern United States, reaching as far west as Texas, or north as far as Washington, D.C. According to air weather patterns around Cienfuegos, it would take only 24 hours for radioactive materials to reach Southern Florida and approximately 48 hours to reach the Eastern United States. Therefore, as many as 80 million Americans could be exposed to a virtually deadly radioactive cloud. The alarm with respect to the Juraguá NPP is not only for the United States. Cuba, Caribbean and Central America countries; Colombia, Venezuela, Brazil and Mexico are also highly concerned. Sub-standard technology and inadequate safety measures have been included in the design and the construction process of the Juraguá NPP. Among the design defects of the Soviet VVER-440 Pressurized Water Reactors is the containment dome, which was designed to withstand only 14% of the pressure required by U.S. standards. The construction process is even worse than the design. Perhaps as many as 60 percent of the soviet-made parts in the Juraguá reactors are defective, according to estimates. Furthermore, nearly all of the reactor parts, excluding the materials for civil construction, such as concrete, were supplied by the Soviet Union under mutual economic collaboration arrangements. Breakdown of the Soviet Bloc led to the suspension of the reactors’ construction in September, 1992. When construction was discontinued, critical components of the nuclear reactors, including the reactor vessel, six steam generators, five main coolant pumps, 12 isolation valves and other essential equipment were left exposed for more than six years to highly corrosive salt air and rain, thus increasing the risk of severe damage. Their quality and safety are questionable. • the design of the electrical and emergency power supply. The possibility of an accident occurring at Juraguá upon its operation, according to experts, is 15 percent. According to international standards the probability of an accident at nuclear facilities should be less than one percent, and therefore the Juraguá NPP should not be completed, at least not without significant safety improvements. Additional safety concerns are posed by the fact that the Cuban nuclear program lost its fundamental base after the disintegration of the former Soviet Union, and the lack of a proper nuclear safety culture in Cuba. The geological situation at Juraguá NPP site is also a risk. U.S. federal officials believe that the reactors rest on an active earthquake fault line. A relatively small tremor could have large consequences. Furthermore, if concluded, the Cuban NPP, will produce radioactive wastes, which will pose an additional threat to the radioactive waste management. Around 1.4 metric tons of radioactive wastes are produced by a standard nuclear fission plant in one year. Other nuclear wastes, originating from the nuclear research centers, hospitals, food irradiation plants and other Cuban nuclear facilities, represent added risk to the Cuban population and environment. A brief description of each one of these components follows, including a preliminary rationale for costing. 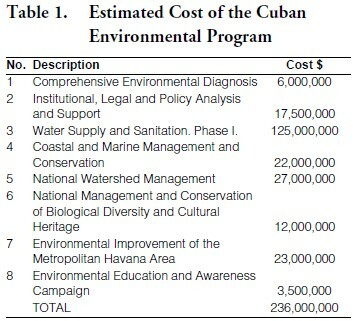 The environmental program outlined herein represents an investment of over $236M (see Table 1 above) which will contribute to fuel the Cuban economy during the initial years of its re-insertion into the world economy. But most importantly, it will provide the bases for the establishment of an effective environmental management system in Cuba. Description of general environmental conditions and problems in this document is based on reference material and it serves well for illustration purpose. However, the basis for a complete environmental program in Cuba must be broadened and established on scientific evidence. In essence the diagnosis will include an environmental base line study of Cuba that could be used for several purposes in the future. The main report from this effort will be the first state of the Comprehensive Natural Environment Program that will be prepared as a routine output of the environmental management system that must be established. The information contained in this report will provide the basis for future environmental planning and serve as a point of departure for comparison and assessment of specific intervention for economic development and growth and for improving environmental conditions and restoring the rates of renewal of natural resources. The effort should be carried out over a three-year period and should produce intermediate reports on specific topics or regions where additional efforts are required to properly characterize the current conditions. These intermediate reports will have the form of Terms of Reference for additional work to be performed in a collaborative approach between Cuban and foreign engineers, environmental, and social scientists. The general format for these additional studies should follow the Strategic Environmental Assessment Format that has been developed by international funding organizations under the leadership of the World Bank. Strategic environmental assessments should be implemented for the most important economic sectors as well as critical geographic regions within the country. World Bank guidelines should also be used as a point of comparison to establish the seriousness of the problem encountered and the need for remediation work. – Eastern Provinces: Guantánamo, Holguín, and Santiago de Cuba. Estimated Costs: $6M. Costs are based on an estimated effort of three years in order to complete both the environmental profile report as well as the strategic environmental assessment reports. The costs are mainly associated with personal services for both Cuban ($1.4M) and expatriate specialists ($2.5M). Additional costs include travel, lodging, meals and incidental expenses ($600K); sample collection and laboratory analysis ($1.0M) report preparation and distribution ($500K). The basis of future environmental law in Cuba will require the adoption of principles of strict liability for environmental damage along the lines envisaged in the UNCED Conventions of the last decade. A legal system with appropriate reforms in the burden of proof and conflict resolution mechanisms can be summarized as ‘The Polluter-Pays Principle.” This principle started out as an economic incentive that has become a cornerstone of environmental law. A legal system with strict liability can be developed with the Polluter-Pays Principle so that the polluter bears the costs of pollution and control measures. Reforms to Cuban environmental law requires that liability be placed on the polluter and to alleviate the economic burden on the state. The principle is not exclusively designed to punish polluters but to set appropriate signals in place in the economic systems so that the environmental costs are incorporated in the decision-making process so as to promote sustainable development in Cuba. • strengthen the technical and operating capacity of the executing national agency and of the agencies responsible for the environment at the national and provincial levels. • finance the preparation of other environmental projects. Estimated costs: Costs for this initiative are estimated to be approximately $17.5M for a period of about 5 years. Roughly $1.5M is estimated for the design of the project and $16M for its implementation. • support the utilities that provide water supply and sanitation services to maintain and enhance their administrative, financial and operating mechanisms, as well as the agency responsible for sector planning, policy-setting and regulation. Estimated Cost: The project shall include the following components, with an estimated cost of $125M. • technical support and training, institutional strengthening of the utilities providing services and of the agency responsible for sector planning, policy-setting and regulation ($10.5M). • design a nationwide investment program and make an assessment of its socio-economic, institutional, financial, legal and environmental feasibility, including cost recovery mechanisms for the investments. Estimated Costs: Costs are anticipated to run in the order of $22M including: $2.2M for project design and related feasibility studies; $6.5M for technical assistance and training for project implementation; $11M for vehicles (both terrestrial and aquatic) and equipment for enforcement and control) and $2.3M for quality control and evaluation. • strengthen the environmental management capacity of state institutions. • provide institutional strengthening for participating agencies. Estimated Costs: The cost for execution of this component has been estimated to run in the order of $27M during a period of 5 years. These costs include an estimated 5% for the design and preparation of several feasibility studies. • support actions, including strengthening of the executing agency’s business and marketing management, educational training for the surrounding communities, and promotion of artisan activities. • educational equipment and materials. • civil works to recondition and build sewage treatment plants, septic tanks and sanitary landfills. Environmental education is not a well developed part of the current general curriculum in Cuba. Greatest improvements could be made through greater emphasis at the junior school level. Development of this curriculum may take one year and require another two years for implementation. Cuban universities already produce many teachers with a background in science and natural history, so further investment in teacher training may not be very high. For adults, various environmental documentaries are currently produced by Cuban television or imported from overseas. However, the quality could be improved with greater funding and a dedicated environmental/ natural history promotion. Estimated Costs: Costs have been estimated in $3.5M for an initial three-year effort, after which an evaluation should be conducted and adjustments made to the overall approach as required. • Further development of the other topics to the level of project profiles. The recommended actions include the development of position papers that can then be discussed in specialized workshops with different groups from the private sector and academic organizations related to the issues. Depending on the subject and the concerned groups attending and/or sponsoring, the workshops may be arranged and held in several cities of the United States, including Miami, Washington, and New Orleans, among others. Ideally these workshops will be carried over a one-year period. After that, a reevaluation of the program should take place according to the actual changes observed in Cuba and the likelihood of the transition to a free, democratic society. 1. This contribution is based on a research paper sponsored by the US-Cuba Business Council. The authors assume full and sole responsibility for its content. USCBC does not necessarily share or support the viewpoints of the authors. 2. Tectonic plates are the geologic masses of the earth that are in constant movement and that are responsible for the displacement of the earth’s continents. At the meeting point one of the plates goes under the other causing a deepening of the earth’s crust and releasing energy responsible for earthquakes and other telluric phenomena. 3. Agenda 21 is the consolidated position of the Latin American countries to the Global Convention on the Environment of Rio de Janeiro, the Rio Convention. 4. Nutrient loading refers to the increased levels of nutrients such as nitrogen and phosphorus coming from point and non point sources that are normally conducive to the deterioration of water quality and the quality of the aquatic ecosystems. 5. Karst geology is that dominated by dissolution of limestone.